The emerging trends in technology cover all aspects of human existence. Innovations developed on a daily basis improve the quality of our lives by simplifying tasks, providing greater efficiency and saving money in the long run. The technologies being researched, or in current use, in medicine are particularly amazing. While once only the vision of science fiction writers, devices now manufactured for healthcare offer a staggering array of options that benefit patient and physician. Melanoma is one of the most deadly forms of cancer, which is why physicians often perform biopsies on questionable-looking moles. However, often times patients undergo unnecessary invasive surgical procedures only to learn that a mole was essentially harmless. The MelaFind scanner provides dermatologists with additional data for determining whether a lesion requires further investigation. The scanner has the ability to eliminate concerns, save patients from procedures and reduce medical expenses. Created by MELA Sciences in Irvington, NY, the unit contains rfid techology initially only provided to the Department of Defense. The device scans the surface of a questionable lesion then compares the retrieved signals to a registry log having 10,000 digital images of melanoma and other skin diseases. The data provides physicians with more instructional information in order to determine whether to proceed or omit further treatment. Millions suffer the chronic and excruciating pain associated with cluster, migraine or similar types of headaches, necessitating daily prescription medications or visits to the E.R. Researchers learned that many of these maladies are connected with irritation of a facial nerve bundle called the sphenopalatine ganglion or SPG. Autonomic Technol, Inc., in Redwood City, CA, is in the process of performing clinical trials on a special electronic unit designed to interfere with pain signals. Surgeons implant a small nerve stimulating device into a patient, on the side typically affected by the headaches, and in contact with the SPG bundle. When an individual experiences the onset of discomfort, they hold a small remote to the cheek near the implant. 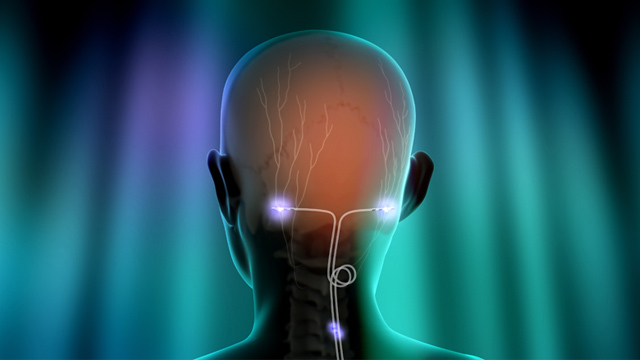 The device emits a signal that inhibits the nerve bundle from transmitting pain signals to the brain. The evolution of medical assistive devices includes making the lives of Diabetes patients a little less painful. Traditionally, patients diagnosed with insulin-dependent forms of the disorder require a prescribed number of invasive blood tests throughout the day, which help determine the correct dosage of insulin injections. Echo Therapeutics in Philadelphia, PA, has developed techology that replaces the need for acquiring a drop of blood with a skin patch. Comparable in size to an electronic toothbrush, the unit removes topical skin cells from a small area, allowing the biosensor access to emit and receive an electronic signal from the blood. The unit then transmits the information to a monitor that initiates an audible alarm if blood sugars are out of a targeted range. The device also maintains a log to monitor glucose levels. Many believe that telemedicine is the wave of the future. In addition to connecting patients with healthcare providers, the technology also enables communication between clinics, hospitals and other medical facilities with rural and underserved regions of the country in attempts at providing a higher quality of care. InTouch Health and iRobot Corp. have created the FDA approved RP-VITA robot, which performs a number of vital tasks that eliminate the need for human intervention. Equipped with a two-way video screen, medical monitoring equipment and special programming, the robots navigate through hospitals while making routine rounds, coordinate the efforts of the healthcare team and provide instructional information when needed prior to discharge. Upon entering a patient’s room, the unit uses rfid technology to appropriately identify occupants, allows multiple physicians to check on patients, retrieves information and transmits the data to necessary locations. In an emergency situation, robots also have the capability of being used as a means of contacting a family member. For some patients, a new heart valve becomes essential. However, in a debilitated state, open-heart surgery may prove too stressful. The Sapien Transcatheter Aortic Valve was developed as one of the types of alternatives to conventional surgeries. Edwards Life Sciences in Irvine, CA, manufactures the technol that is now being implemented in heart centers across the country for frail patients. Unlike traditional heart surgery, cardiothoracic surgeons insert the device using catheterization through a main artery. Attaching the bovine derived valve to a stainless-steel stent, surgeons advance the valve through the artery until reaching the appropriate position. Once in place, a balloon inflates, expanding the device, which anchors to the chamber walls and functions like a normal valve. The special Sapien procedures also reduce patients cost and encourage quicker recovery. The evolution of medicine, in terms of technology in the 21st century, serves to provide better care for patients while enabling healthcare professionals to perform intricate tasks with the use of assistive devices. The continued advances in modern medicine provide treatments and therapies that offer a higher degree of problem solving and achieve better results.